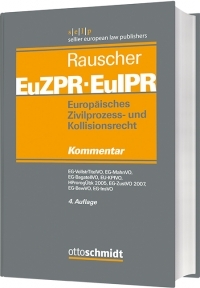 At the beginning of 2015, the publication of the 4th edition of Thomas Rauscher’s commentary on European private international law (including international civil procedure), “Europäisches Zivilprozess- und Kollisionsrecht (EuZPR/EuIPR)”, has started. So far, the volumes II (covering the EU Regulation on the European Order for Uncontested Claims, the Regulation on the European Order for Payment, the Small Claims Regulation, the Regulation on the European Account Preservation Order, the Service of Process and the Taking of Evidence Regulations as well as the Insolvency Regulation and the Hague Convention on Jurisdiction Agreements) and IV (covering, inter alia, Brussels IIbis, the Maintenance Regulation and the new Regulation on mutual recognition of protective measures in civil matters) have been published. The various Regulations have been commented on by Marianne Andrae, Kathrin Binder, Urs Peter Gruber, Bettina Heiderhoff, Jan von Hein, Christoph A. Kern, Kathrin Kroll-Ludwigs, Gerald Mäsch, Steffen Pabst, Thomas Rauscher, Martin Schimrick, Istvan Varga, Matthias Weller and Denise Wiedemann. Further volumes will cover Rome I and II as well as the Brussels Ibis Regulation. This German-language commentary has established itself internationally as a leading, in-depth treatise on European private international law, dealing with the subject from a comprehensive, functional point of view and detached from domestic codifications. For more details, see here.